Definition at line 42 of file llclipboard.h. Definition at line 46 of file llclipboard.cpp. Definition at line 51 of file llclipboard.cpp. Definition at line 91 of file llclipboard.cpp. Referenced by LLTextEditor::canPaste(), and LLLineEditor::canPaste(). Definition at line 56 of file llclipboard.cpp. References LLWindow::copyTextToClipboard(), LLView::getWindow(), mSourceID, and mString. Referenced by LLTextEditor::copy(), LLScrollListCtrl::copy(), LLLineEditor::copy(), LLTextEditor::cut(), and LLLineEditor::cut(). 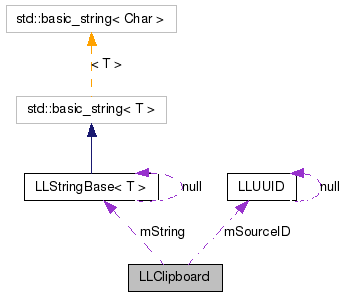 Definition at line 64 of file llclipboard.cpp. References LLView::getWindow(), mSourceID, mString, LLUUID::notNull(), LLWindow::pasteTextFromClipboard(), and LLUUID::setNull(). Referenced by LLTextEditor::paste(), and LLLineEditor::paste(). Definition at line 45 of file llclipboard.h. Referenced by copyFromSubstring(), and getPasteWString(). Definition at line 46 of file llclipboard.h.